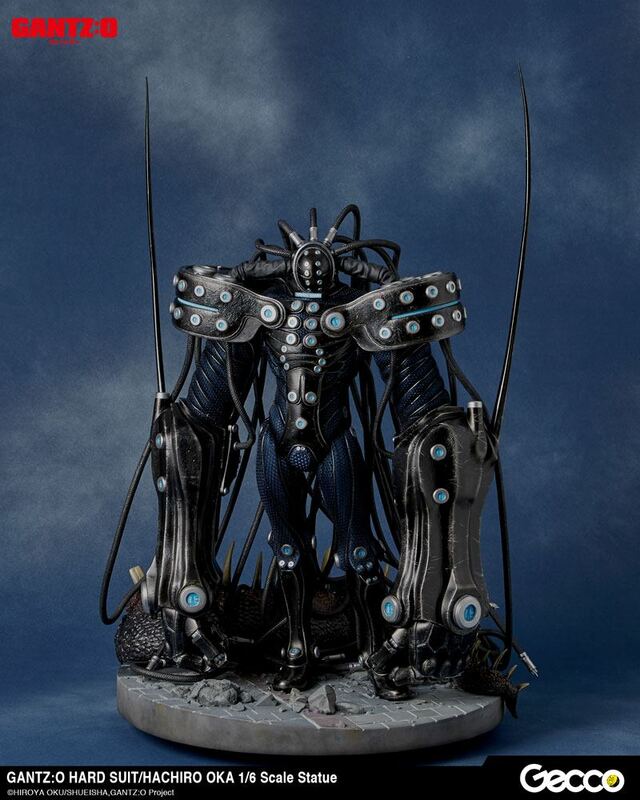 The popular character from the 3DCG film "GANTZ:O" by Hiroya Oku is beautifully finished as a high end collectible statue. The most powerful warrior from the Osaka team. Hachiro Oka. armored in his Hard Suit. famous for scoring 100 points 7 times. is now recreated with overwhelming volume and presence. The details and textures of the suit all sculpted digitally. are faithfully recreated capturing the finest details like damage inflicted during his battles. The production of this complex design utilizes a complex blend of high end materials including Polyurethane Resin. Polystone. ABS. PVC and Soft Vinyl to recreate every detail at a mass production level. The dreadlock style cords attached to his head have bendable metal wire embedded inside allowing for unique pose-ability. The detachable mask reveals Oka's face nestled inside the helmet just like the iconic film scene. which is sure to satisfy the ultimate GANTZ maniac. The base is inspired by the Ebisubashi bridge in Osaka. which was home to the bloody battle field of GANTZ:O and includes the amputated tail of the formidable enemy Nurarihyon. It stands approx. 57 cm tall (42 cm without elbow swords) and comes with display base in a printed box.